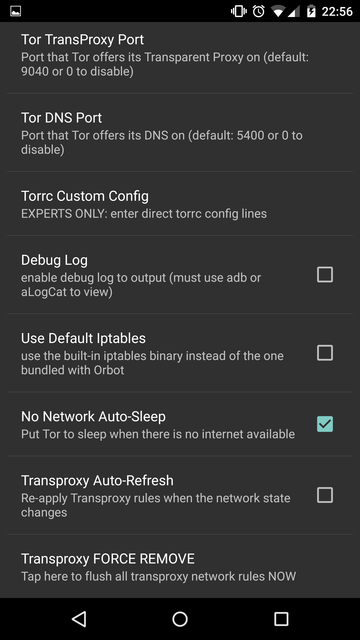 In my last post, I explained how to setup a Global SSH proxy on Android with ConnectBot and ProxyDroid. In this article, I'll do the same thing, but with Orbot. Also, as with the last article, the same precautions apply here. If you're on an untrusted or unknown network, using an encrypted proxy can be helpful. However, just because you're using Tor, doesn't mean you should trust its network blindly either. 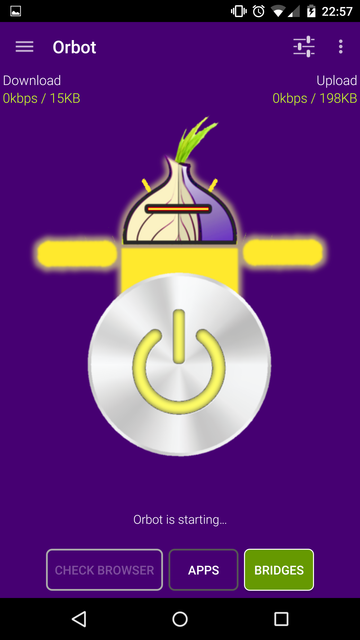 There are all sorts of practical attacks on Tor that have been reaching the press lately, and you would be wise to read them, and proceed with caution. With that said, sometimes all you want to do is get around a content filter, such as viewing Reddit at church, or getting on Twitter while at work. Of course, there are necessary risks with those actions as well. Basically, don't be an idiot. As something you should keep in mind, you may also want to check "Use Bridges". 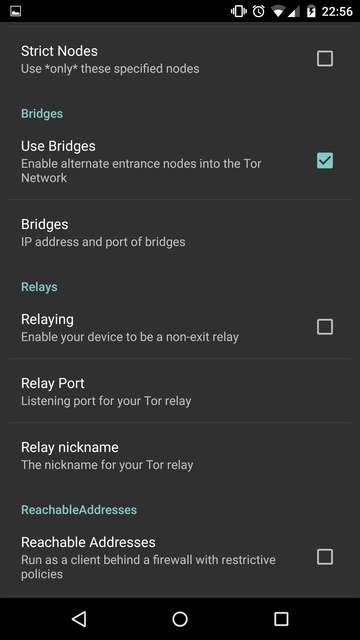 Relay bridges are entry nodes that are not listed in the main Tor directory. As such, it is more difficult for ISPs to filter them. If you suspect that your ISP is blocking all known entry nodes, then using bridges can be helpful to get around the problem. But, using bridges may be unnecessary. Check if your Tor connection is getting filtered first. If so, enable the use of bridges, otherwise, you're just fine using Tor without them. Also, Orbot has some interesting settings, such as specifically setting a whitelist of entry and exit nodes, and a black list of nodes to avoid. If you know someone is operating a Tor node, and you trust them, then I would recommend setting them as either an entry or exit, whichever is appropriate. The reason for this, is it is not impractical for a well-funded organization to have a large number of entry and exit nodes. If so, they can build traffic profiles on who is connecting to the entry node, and which site they are visiting from the exit. However, by specifying specific nodes for either entry or exit (or both), you eliminate this threat. Sadly enough, I could not get this working with Orbot. One last setting that has caught my eye, is "Tor Tethering". 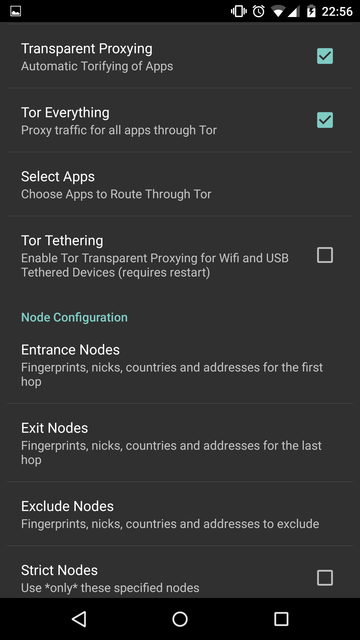 If you use your phone as a wireless hotspot, or USB tethering, you can also transparently route all the traffic from those connected clients through the Tor proxy. I haven't tested this yet with the latest version, but with previous versions of Orbot, it didn't work. Other settings are listed below, page after page. 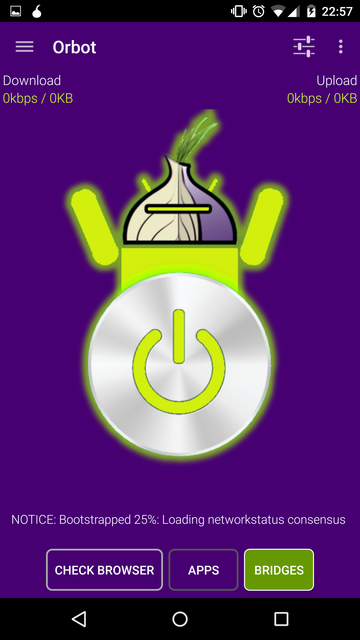 When at the main page of the app, long-tap the power button in the center of the droid, to connect to the Tor network. When the arms of the droid are down, you are not connected. 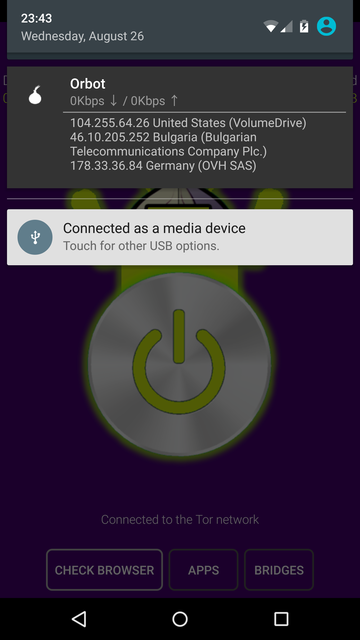 When the arms are yellow, and pointing to the sides of the phone, the app is trying to get a connecting to the Tor network. When the arms are green, pointing up, you are fully connected, and can start enjoying your proxy. 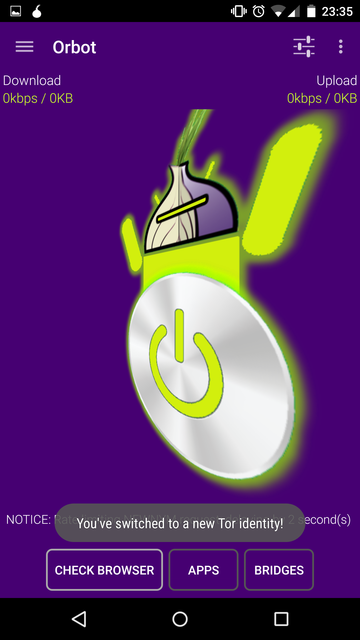 Notice that when you are connected, an onion icon is in the status bar at the top of the phone, showing as a permanent notification. If you have "Expanded Notifications" set, you can get IP address and country information in the notification. 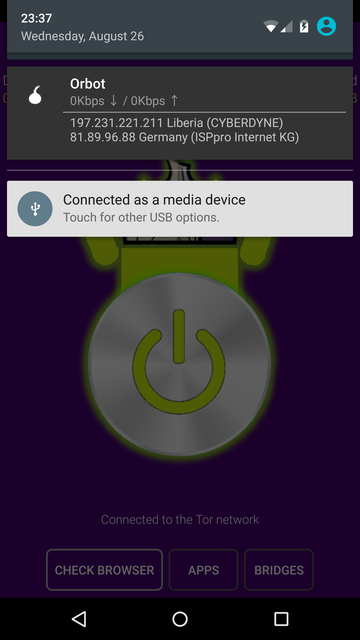 If you swipe the droid right or left, the droid will spin, and you will end up with a new "Tor Identity". Basically, you'll be connected to a new set of nodes. Tapping the "CHECK BROWSER" button at the bottom left of the landing screen will use your default browser app to connect to https://check.torproject.org and verify whether or not transparent proxying over Tor is working. Posted by Aaron Toponce on Thursday, August 27, 2015, at 6:00 am. Filed under Security. Follow any responses to this post with its comments RSS feed. You can post a comment or trackback from your blog. For IM, Email or Microblogs, here is the Shortlink. Thanks alot for nice sharing! I have got much clear idea regarding from this useful information. 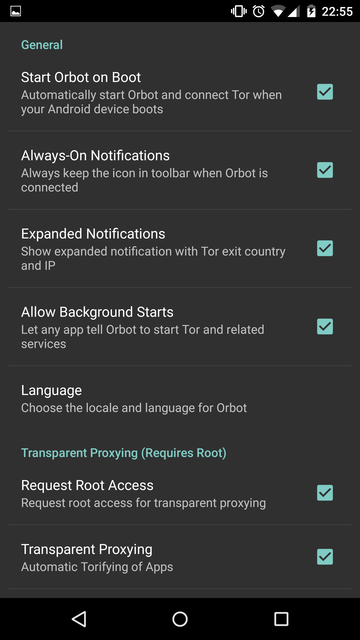 How should i configured US only proxy in Orbot and if i have US proxy ip with me how should i configured with Orbot to use only that proxy instead. Tor is connected. When click to browse after connection orfox is not showing congratulations message neither showing anything else. Just buffering for 25%and stop there. Does that mean orbot not configured properly? Help me .